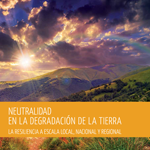 This publication reviews efforts to define and identify how to deliver a land degradation neutral world as part of the post-2015 development agenda. The publication presents issues discussed by the Intergovernmental Working Group (IWG) about the follow up of the Rio+20 outcome. It examines the overlaps among the objectives of the three Rio Conventions (United Nations Convention to Combat Desertification, UNCCD, United Nations Framework Convention on Climate Change, UNFCCC, and Convention on Biological Diversity, CBD), and notes benefits of adopting common land management policies and practices.